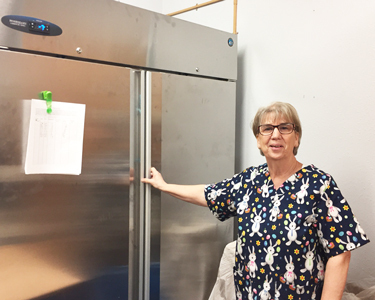 When students from Armand Larive Middle School attended a Culinary Workshop in Umatilla, hosted by Oregon Department of Education and the Oregon Dairy and Nutrition Council, they saw their school nutrition professionals in action. This post debuts a great new video they created to share their experience. The Culinary Workshop is one of six regional workshops offered to school nutrition professionals throughout Oregon to help improve child nutrition programs. “I want to make sure we have a variety of foods represented, because these folks help make the menus for schools,” said Chef and Registered Dietitian Garrett Berdan. Many of the recipes used for this workshop are from Food Hero (www.foodhero.org) , an online resource with shopping hints, cooking tips and videos, to help Oregonians improve their health with affordable and healthy recipes. While attending the workshop, Armand Larive Middle School students interviewed, taste-tested and even gave their feedback on the finished recipes to re-cap the day. This is one of many video projects they have done with video equipment provided through a Fuel Up to Play 60 Grant. 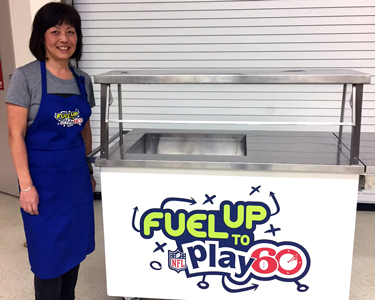 Fuel Up to Play 60 is a school nutrition and exercise program launched by the National Dairy Council and the NFL to improve health and encourage today’s youth to live healthier lives. Grants are available to qualified K-12 schools to jump start healthy changes in the school environment. Try this delicious, hearty chili on a cold, wintery day or any day. For a simple dessert or snack later on, choose fruit. Heat oil in a large saucepan. Sauté chicken, onion and garlic powder until chicken is no longer pink inside. Add the beans, broth, chilies, and seasonings. Bring to a boil. Reduce heat. Simmer uncovered for 30 minutes. Remove from the heat. Stir in sour cream and milk. Fuel Up to Play 60 grant funding provided by local dairy farmers is making a difference in Oregon schools. Armand Larive Middle School in Hermiston received a grant of $3,555 to purchase a computer, accessories and software for video production. The new computer equipment enables students to make Food Hero time lapse recipe videos to help educate students on healthy recipes. For the application, the school teamed with Angie Treadwell, Family and Community Health Umatilla-Morrow SNAP-Ed Program Coordinator for Oregon State University Extension Center. “We are excited for the opportunity to help Armand Larive students gain additional experience in video production while educating and promoting healthy behaviors among their peers and perhaps, the community at large,” said Treadwell. Additionally, with the new computer equipment purchased, students were able to compete at the Student Television Network Conference in Anaheim, California in March. Under the category of Middle School Anchor Team, Armand Larive took 2nd honorable mention. At a special school assembly in April, the Food Hero videos were shown to the student body while they enjoyed tasting the ever-popular“Popeye Power Smoothie.” All of the videos created by the students are now on www.FoodHero.org. 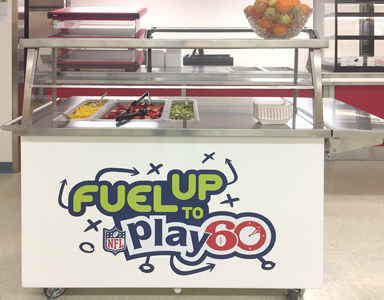 Fuel Up to Play 60 is an in-school nutrition and physical activity program launched by the National Dairy Council and NFL, in collaboration with the USDA, to help encourage today’s youth to lead healthier lives. To learn more about the grant visit www.fueluptoplay60.com. Sponsored by the Oregon Dairy and Nutrition Council and the Oregon Department of Education, Child Nutrition Programs, a new series of five popular culinary training events are underway to help improve school cafeteria menus for Oregon students. For the past seven years, Chef Garrett Berdan, RDN, has been coaching child nutrition program professionals at regional trainings on cooking innovative, healthy meals using nutrient-rich, local foods. At the training events, participants prepare and taste test 15 actual recipes they can bring back to their students. The preparation of healthy meals for students emphasizes nutrient-rich foods, because studies show that well-nourished kids perform better at school. Participants practice menu planning, weights and measures, knife skills and other culinary techniques. This year’s series includes stops in Klamath Falls, Ontario, Lincoln City, Central Point and Aurora, Oregon. Trainings were held last year in Albany, Hermiston, McMinnville, Central Point, Salem and La Grande. Schools and childcare programs in each region are invited to participate in the two day training free of charge. As part of an ongoing commitment to youth wellness and education, Oregon’s 228 dairy farm families and 29 dairy processors are involved with schools across the state, supporting programs such as this training. Schools across Oregon have innovative projects underway focused on youth engagement, nutrition and physical activity, thanks to Fuel Up to Play 60 grants funded by Oregon dairy farmers. 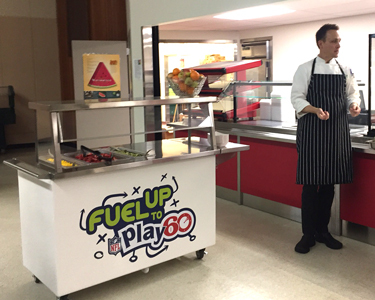 Fuel Up to Play 60 is the largest in-school health and wellness program in the country. The Oregon Dairy and Nutrition Council, in partnership with the National Football League, U.S. Department of Agriculture and the National Dairy Council, awarded grants to eight schools throughout the state last fall. With grant funding, schools are purchasing blenders for yogurt smoothie classroom celebrations and carts for grab-and-go breakfast options. Brand new pans and salad bar inserts will be featuring fruits and vegetables from school gardens in cafeterias. Noise cancelling blankets are going up in one cafeteria to reduce noise and bring Smarter Lunch Room concepts to students. One school is using funding to create time lapse videos featuring Food Hero recipes highlighting whole grains, fruit and low fat dairy. Physical activity goes hand in hand with nutrition for Oregon students. Students will be energized and ready to focus on learning throughout the day by participating in brain breaks in class. Students will be stretching out in yoga poses, checking their heart rates with monitors and counting steps with pedometers.